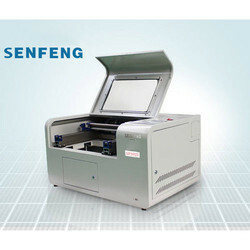 SF3021 Small Laser Engraving Machine can process non-metal materials such as acrylic, glass, paper, bamboo, stamp, rubber, leather, etc. SF1390 laser cutting engraving machine adopts DSP digital controlling technology, self-design laser power supply, incorporate designed frame and structure to guarantee stable work. The newest software is matched to AutoCAD, core IDRAW CAD and all other graphics processing software for outputting original graphics. This series machines firstly use USB port data interface which supports hot-plugging and momentary data transmission to realize high efficiency without accounting computer resource. The LCD controlling panel brings friendly computer-human interface and easy operation. It uses USB port data interface with the large mass storage device to provide high working speed and efficiency. 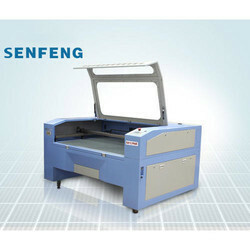 SF1390 laser cutting engraving machine can cut acrylic, plastic, paper, foam, fabric, leather, rubber, MDF, plywood, and engrave on acrylic, bamboo, plastic, leather, MDF, plywood, glass, stone, etc. SF1390 laser cutting engraving machine is widely used in cutting acrylic, MDF, plywood, paper, foam, etc; engraving acrylic, glass, MDF, wood, double color board, bamboo, etc. It is equipped with co2 laser tube, working size 1300mm x 900mm, mainly cut rubber plastic, cloth toys, leather, computer embroidery cutting, mould, crafts, bamboo and wood, advertising and building decoration, packaging and printing, paper products. 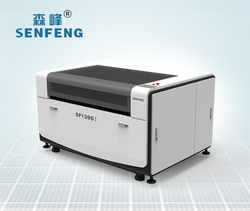 SF1390E 80/100W Co2 Laser Engraver And Cutter is especially for cutting fabric, leather, paper, cloth and other nonmetal materials. Application Industry: Garment, Shoes, Textile, Embroidery, Leather, Bag and cases, Outdoor Sports, Car seat, fabric, etc. Application Material: Leather, artificial leather, Soft Leather, Decoration Leather, Packing Leather, Cotton, Silk, Chemical Fiber, Jeans, etc.